We will have a Holy Hour Adoration at 8.00 am before Mass this morning (April 1) to prepare for our forthcoming retreat during the Palm Sunday weekend. Please take special note of the following important information and mark your personal calendars. This will also be posted on our parish website. Our Lenten Retreat: by Rev. Fr. Jose Mulangattil MCBS is moved to April 7, 8, 9, the Palm Sunday Weekend. April 8, Saturday: 9.00AM Mass to 4pm, Confessions: 1.30pm to 3.00pm. April 9, Sunday: 11.00AM Mass to 5.00PM. Baby sitting will be available for Pre-K to 2nd grade kids. Masses on Fridays with Way of the Cross will be 5.30PM as we always had it. On alternate Friday's Way of the Cross will be in English. On April 7, Friday, the stations will be held in English at 7.30PM together with the St. Boniface Community within our retreat. 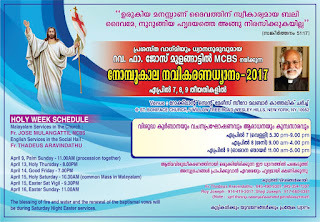 ••••Passion Week Services in English also: This year, for Passion Week, we will be adding English language based Syro Malabar Rite services. Passion Week services (Palm Sunday, Holy Thursday, Good Friday and Easter Not got Vigil will be conducted at the same times in the Church and Social Hall. 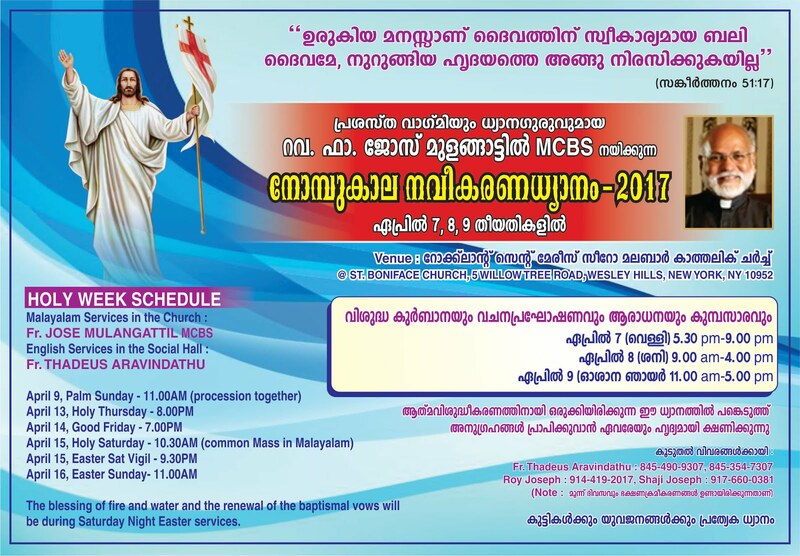 There will be only one Mass in the church on Holy Saturday morning at 10.30 AM (Malayalam). Retreat preacher, Fr. Jose Mulangattil will preside over the Malayalam services and I will do the English services. 9.30PM - Easter Vigil (We will move the blessing of fire and water and the renewal of the baptismal vows to the Saturday Night Easter services. First Holy Communion and Confirmation will be presided over by Mar Joy Alappat on Sat, May 20 at 10.00AM. There will be no Mass at 9.00am that day. Our Parish Picnic will be jointly help with the St Boniface group on Sat, June 24 after the 9.00AM Mass in the church-grounds until 4.00PM. --Graduation: On June 25, Sunday, the 11am Mass will be specially celebrated for all 🎓 graduates. Please sign up names at the helpdesk and attend Mass wearing the gown and hat. Family and Friends' Night, CCD school and Mary Matha Malayalam school Anniversary will jointly be held on Sat, July 8 at Knanaya Center, Stony Point from 3.00pm. Next Sunday, March 26, we will have the opportunity to register for the upcoming retreat in AUGUST this year by Fr. Xavier Khan Vattail from the Sehion Retreat Center in Attapady, Kerala. Fr Royson Menonickal from the Bronx church will offer the 11 am Mass and invite us to the retreat. Please make sure that those who are interested and are in town during that time book seats ASAP. Lenten Pastoral Letter from Bp. Angadiath. Here is another flyer of the retreat during this weekend (March 17-18-19, starts this evening) at Marian Shrine, Stony Point. Address is on the bottom of the flyer. Those who are unable to attend our retreat in April and go to confession may attend this one. Fr Augustune Vallooran from Divine Retreat Center, Kerala is conducting retreat for all in English as per the flyer attached. This is a great opportunity for all men above age 18 to attend a very enriching one day retreat to prepare for Easter and thereby to make the Lent a fruitful one. Parents, if you can positively encourage your young adult sons to attend this Conference, it will be worthwhile. Please do register online or let me know, if you are going. I will register it as a bulk order. Its $40 per person until tonight. Then its going to be $50. 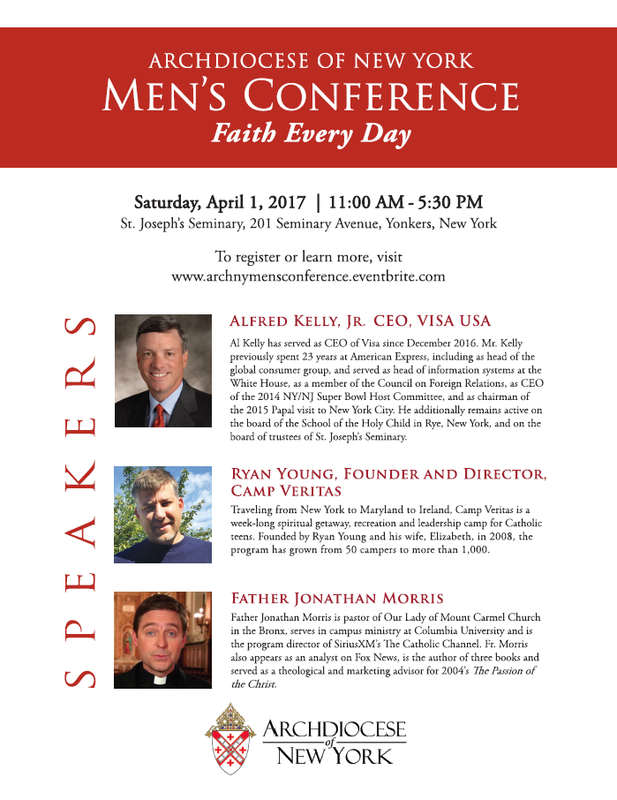 Cardinal Dolan hosts this event. If you are not able to attend any other retreat during this Lent, I strongly suggest that this is the opportunity for you. 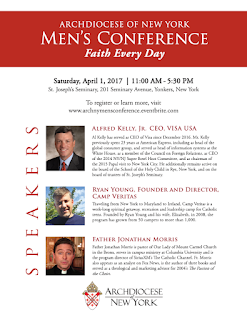 The Archdiocese of New York Men's Conference is a day for Catholic men to gather together for fellowship, spiritual enrichment, and practical insights on how to live their faith.